Sponsored Post: This post is sponsored by Lamps Plus but the content and opinions expressed here are my own. I’ve always loved a good space for inspiration. From cafes to boutiques there is something special about *pretty spaces*. When I was designing my office I knew I wanted the space to induce happy thoughts and inspiration and hardly anything brings me happiness the way my travels do! A travel inspired office design was necessary for my space! 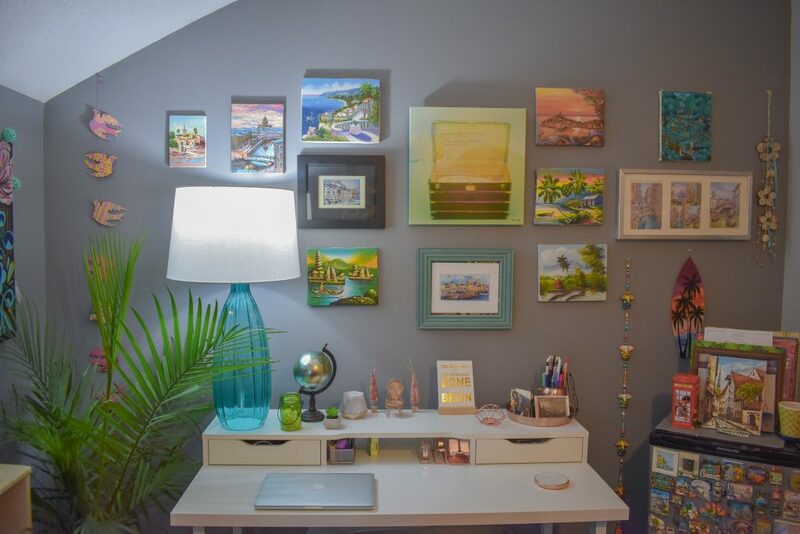 I used my trinkets, photos and paintings that I’ve collected from around the world to be the focal point of inspiration in my office. I have collected paintings, magnets and trinkets on all of my adventures, from Bali to Morocco. The most difficult part of tying all of my pieces together was deciding on lighting! That’s where my friends from Lamps Plus came in to make my life a little easier. Their large selection of lamps (seriously, they have SO MANY OPTIONS!) made it easy for me to pick out two lamps with teal blue tones that tied in to my travel theme. 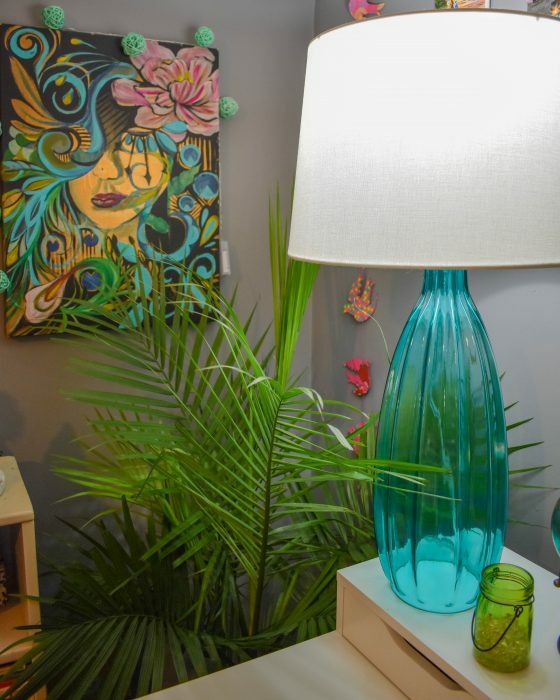 So many of my pieces that I’ve acquired during my travels have pops of bright blue and it was so fun to pick out lamps from Lamps Plus that matched my decor. 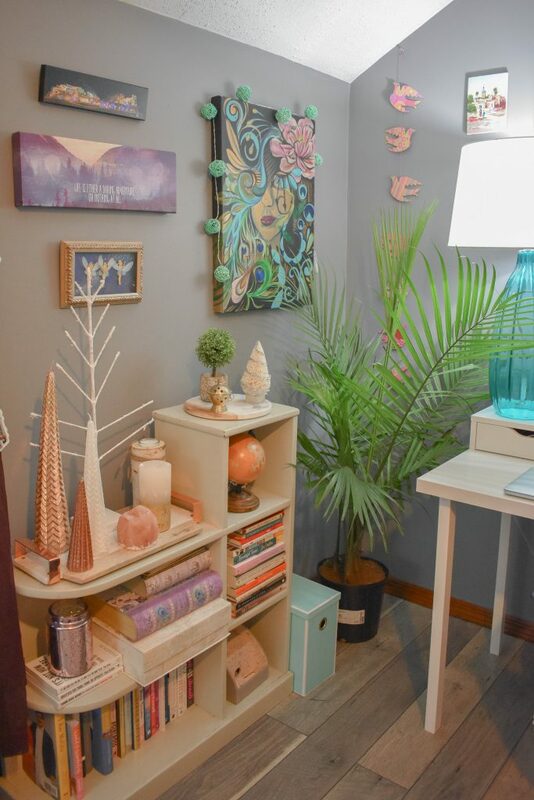 What was even better about the Lamps Plus lamps I chose is that it also brings all my decor together. Whereas before it looked a bit scattered and mismatched – now it all blends perfectly! 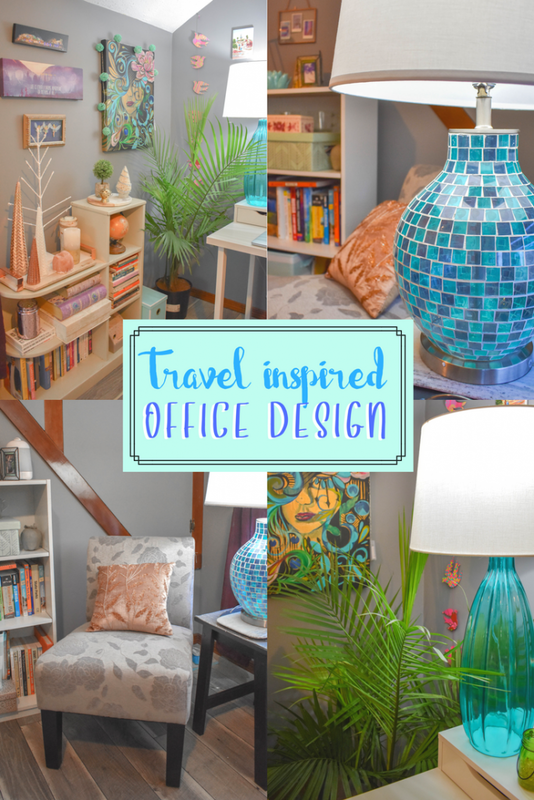 Check out some photos below of my travel inspired office design! My desk area is bright and light thanks to my Lamps Plus Stella 30″ High Blue Fluted Glass Table Lamp. It ties in all the blue hues from the paintings above my desk! The shelves next to my desk are also lit up thanks to my new Stella Lamp! All of the trinkets! I love collecting magnets from around the world and look at how many of them have blue hues! 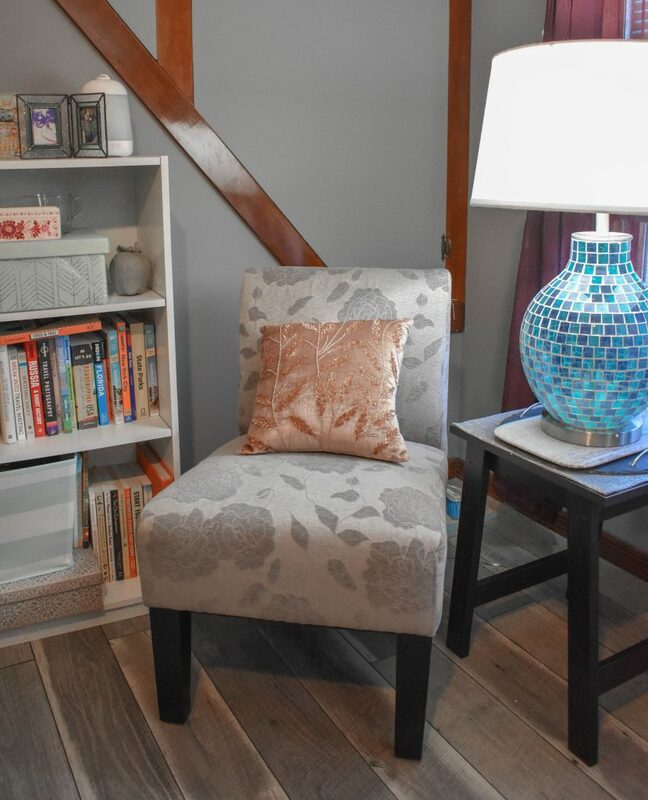 My corner reading nook is lit to perfection thanks to my Lamps Plus Teal Blue Glass Mosaic Jar Table lamp. All in all, I could’ve never pulled all the pieces in my office together without the help from Lamps Plus and their gorgeous lamps! If you’re in the process of designing, or redesigning a room, I highly suggest looking at lamps to tie the whole space together! 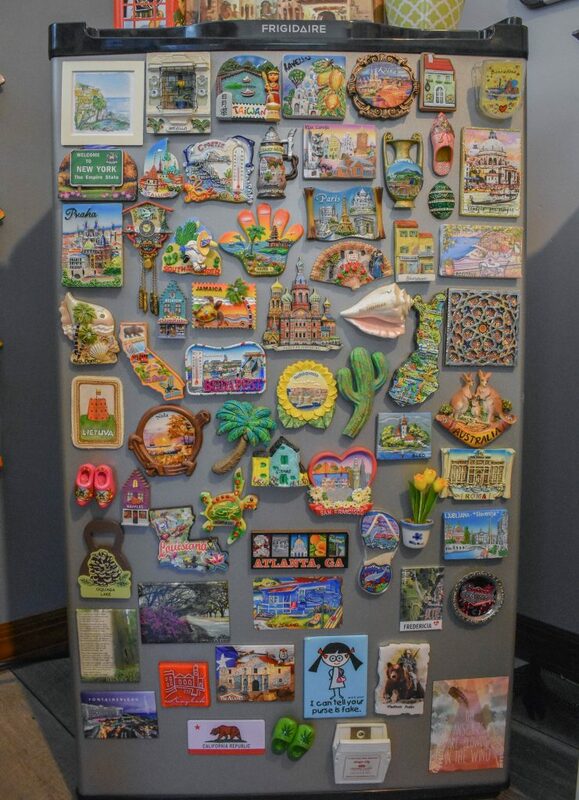 I collect magnets from all over as well! I cannot leave a place without one. I love your space and the grey walls that allow all your hues to POP! Thanks so much for the wonderful compliments Amber! That’s totally why I went with the grey walls in the first place! Aren’t magnets the best?! Where have you collected them from?! Me too! I always buy one when I’m in a new city. For now my collection is about 15 magnets, not too much but hopefully it will be bigger 🙂 I was sure that I’m the only one person who do it but I see more mangets lovers here.